TeddyBhoy had the most liked content! Just moved to Glasgow - open to suggestions! Bushcraft, Survival, Guns, Pyro's, Making things and the occasional video game. 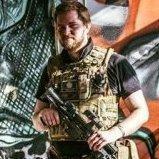 Just bought my ticket for the British Airsoft Show, look foward to putting faces to names. Ah crap. Wish I would of known this before I bought my ticket! Well you never know, it might be better this time around. I just don't want to risk the money on it after last time.